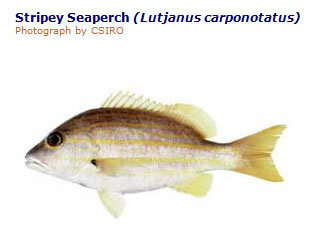 Wild/Farmed Wild, Some species, such as golden seaperch (Lutjanus johnii), show potential for aquaculture. Some larger species, such as paddletail (Lutjanus gibbus) and red bass (L. bohar), have been known to cause ciguatera fish poisoning in some areas and should be avoided. Most seaperches have superb white flesh and a delicate, yet generous, flavour. They can be prepared in a wide range of ways including grilling, poaching, deep frying, shallow frying, baking and steaming. Simple pan-frying allows for a range of different flavours and textures to be utilised. Seaperches are often large, but the smaller fish are excellent baked whole (gilled and gutted). Lay fillets on a bed of leeks and fennel with a small amount of fish stock. Cover and bake until just cooked. Keep the fish warm while the leeks, fennel and stock are purÈed. Heat this gently and blend in crËme fraÓche. Season to taste and pour over or under seaperch fillets and add a few roasted cashews. A range of wines can be served with seaperch, including chenin blanc, colombard and semillon sauvignon blanc blends.